Whether buying an existing home or building a new one, savvy homebuyers in Hawaii know that an active Homeowners Association (HOA) can protect and enhance property values through their Codes, Covenants, and Restrictions (CCRs). Kuwili Lani, the Big Island’s newest community along the Hamakua Coast and only agrihood on island, is based on principles of sustainability, including energy conservation, use of green building materials, and the prudent management of natural resources. Situated on the slopes of Mauna Kea in Laupahoehoe offering stunning ocean and pastoral views, each of the 11 one-acre lots within Kuwili Lani have been carefully sited to take advantage of the incredible views and the ability to harness renewable energy. To ensure homes built in this intentional community meet the subdivision’s sustainability goals, the Kuwili Lani Community Association has created design guidelines and CCRs for lot owners who build in this exciting new neighborhood. As the Big Island’s first and only agrihood, Kuwili Lani’s CCRs were created to help people build homes that adhere to “green” sustainable building practices and U.S. Green Building Council’s Leadership in Energy and Environmental Design (LEED) guidelines, where applicable. For instance, homes designed using passive solar lighting and passive ventilation are highly encouraged. Homes that reflect a low environmental impact, such as using materials that are made of recycled materials, can be recycled and/or are produced without waste of energy or resources are also encouraged. You can read more about the types of energy efficient homes intended for Kuwili Lani in our blog. Kuwili Lani is zoned under Hawaii State Land Use Law as an Agricultural District. As such, property owners within Kuwili Lani are allowed to build single-family homes with a minimum living area of at least 1,400 square feet, not including garages, carports, lanais, porches or other similar areas. Per the community’s CCRs, all homes and farm buildings must be less than 30 feet in height although two-story homes will be allowed on a few select lots. Kuwili Lani property owners have a wide range of options in designing and building a home that showcases renewable energy systems while incorporating modern conveniences. This is the only community on island being planned from the ground up with the intention of being truly sustainable and using renewable energy! Lots within Kuwili Lani are also designed for homeowners to grow their own food. The Design Guidelines for Kuwili Lani are comprehensive in scope and cover everything from roofing material to water catchment systems (for harvesting rainwater for farming purposes and irrigation) to exterior paint colors (earth tones are encouraged). 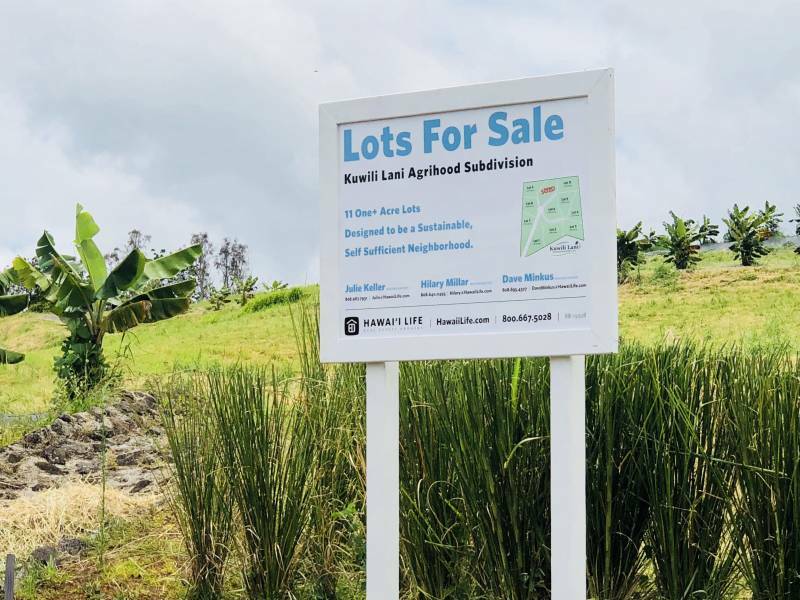 As with many other Big Island private communities, Kuwili Lani lot owners have to submit building plans to the subdivision’s Design Review Authority before they start building their home. The Design Review Authority ensures that homes built within Kuwili Lani meet the community’s design guidelines. Kuwili Lani is such a remarkable new community because no other gated subdivision on island intentionally plans for this level of sustainability and green building practices in their design guidelines and CCRs. It is truly one of a kind and a wonderful place to live for those wishing to pursue a sustainable lifestyle.